13 EASY AND CREATIVE cHRISTMAS TREE ORNAMENTS – diy. This post is in continuation with the ” Green Christmas – Zero Waste initiative” , that I am participating in. 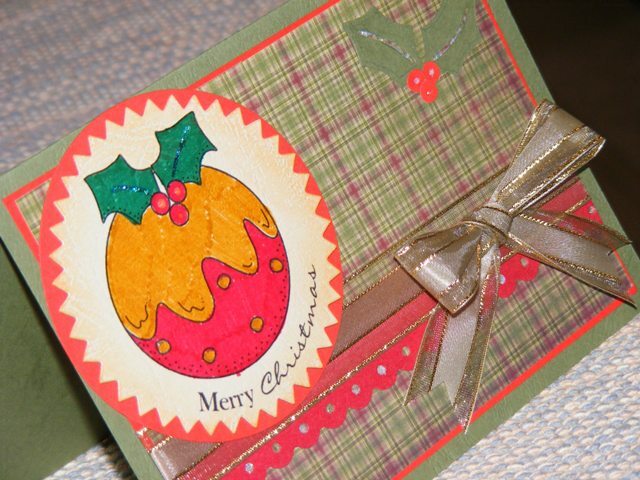 I am sharing a dozen plus ideas to recycle, upcycle and repurpose regular items to make Christmas tree ornaments. Several designs were made from the humble plastic bottle. Please visit here to view the ‘Green’ Christmas light invention !! 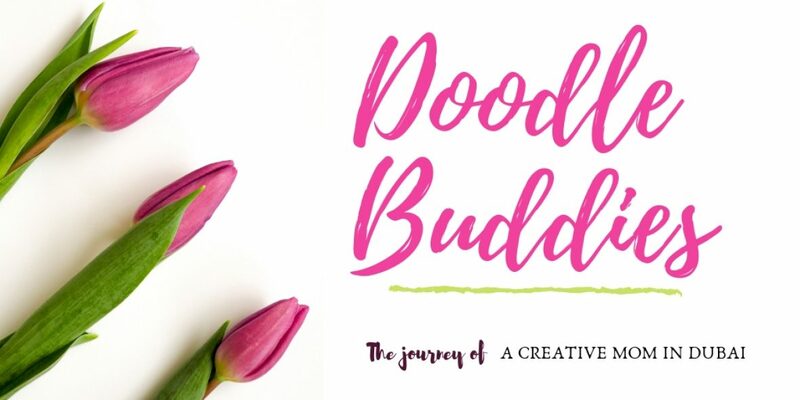 It took just a little ribbon, some fabric glue and a tiny fabric flower to design this in under 10 minutes ! Why not make a dozen or so, with the kids ?? 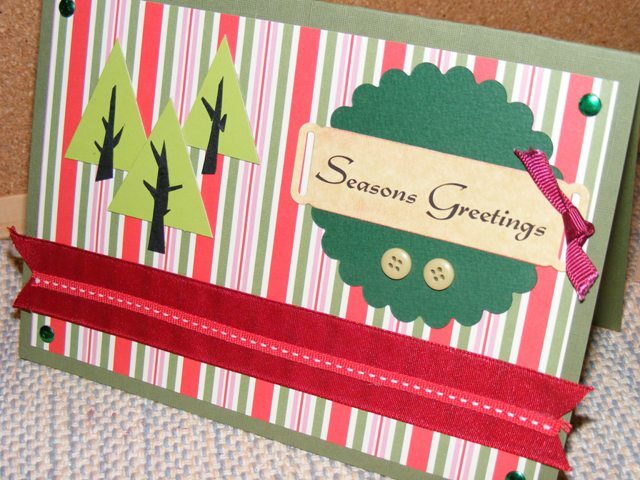 Although I have used my die cut machine, you can easily cut 4 circular shapes out of some fancy design paper, fold it in half and stick the other half to it and add a cord in between before you close it with the 4th side. Voila. I’ve wrapped a jute cord around a styrofoam ball. By far the easiest ! Two fan shapes glued together. A wooden flower embellishment completes the look. These wooden discs were chopped a few months back for another project but they make excellent ornaments too.. Some of them can be used as a tag, or just paint them. These icicle shapes are made from heating plastic mountain dew bottles. Very little maneuvering is required – however please remember to carry it out the process out in the open. Two disc shapes from a Mountain Dew bottle were glued together here. Three different sizes of material were cut from a plastic bottle and gently pressed together to form a teardrop shape. I love how these are nestled into each other. Four different sizes of plastic were glued as circles and glued together at one point. How simple yet pretty this looks ! My favorite. Several hollow circles were glued together. I added some white dots with acrylic paint. I’ve adorned these with mirror embellishments. By far, the simplest ! Although I have used a tongue depressor, you can use any craft stick or popsicle stick. 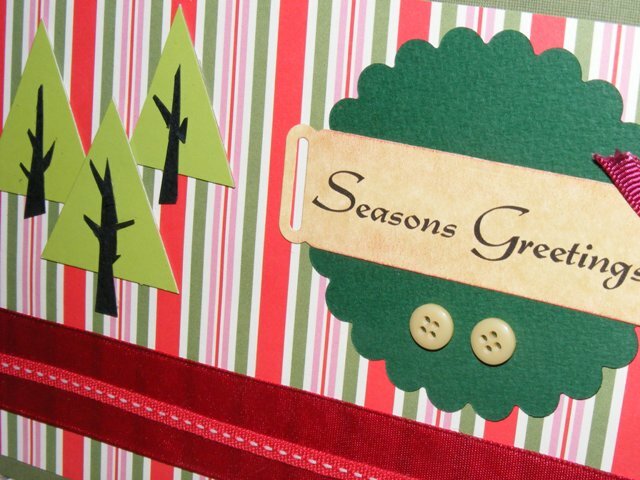 Color it as a candy cane or decorate with some glitter, buttons or even washi tape. This one was a new experiment for me. I fused 9 plastic bottle lids together melting them on some butter paper a with a hot iron box. I am loving it !! you can use lids from Pringles – cut star shapes and get the children to use sharpies to color them or even add some glitter to them. Lids from mason jars, jam jars can be spray painted with merry colors to hang on the tree. Glue three cotton balls to a clothespin – a black felt hat, two goggly eyes, and a tiny orange nose – and we have a snowman ready ! Cut a small piece of cardboard from cereal box in a triangular shape and wrap some green yarn around it ! Hang it with a bell. Pipe cleaners can be tied at one end to form a wreath shape and hung on the tree. Children can have hours of fun designing ornaments with ‘Salt Dough’ too. 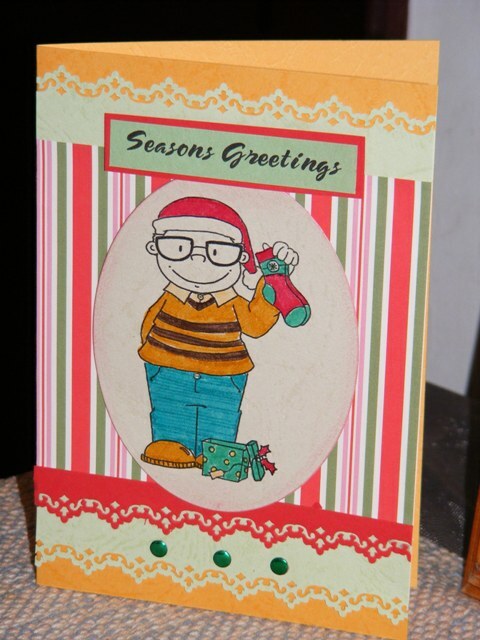 Do you design some ornaments and Christmas decorations at home with your kids ? Or do you only buy them ? Wooden discs from a dead tree trunk. Lovely sketch. 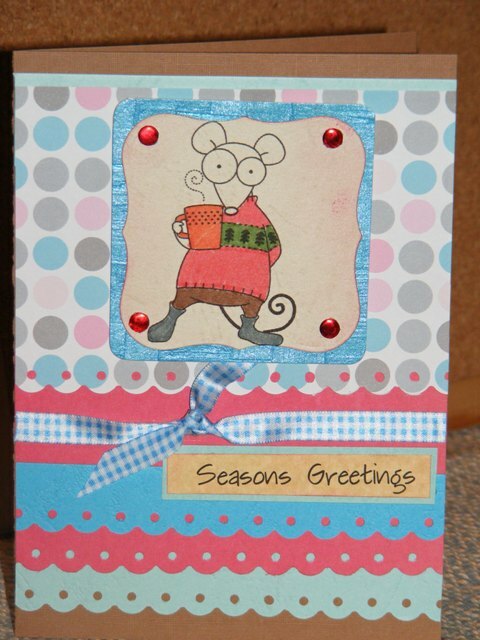 Lots of paper layering, alittle bit of digi stamping, a ribbon here and a brad there and you have a nicey wicey card saying Seasons Greetings from Mr Mousy. Gosh, I just love this little fella. He is so so cute. He is a digi stamp and as usual I picked him up from the freebies !! 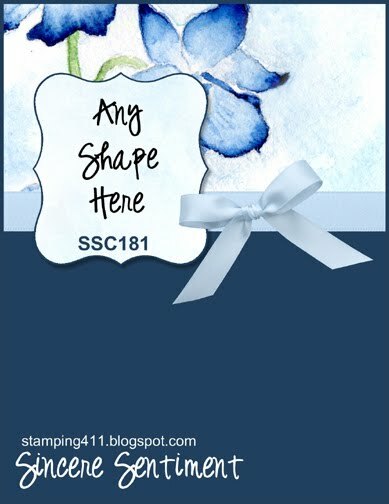 I just love this digi stamp and I also liked ( for once ) how the colors finally complimented eachother. Havent used this ribbon in ages and now am wondering why, its really cute. 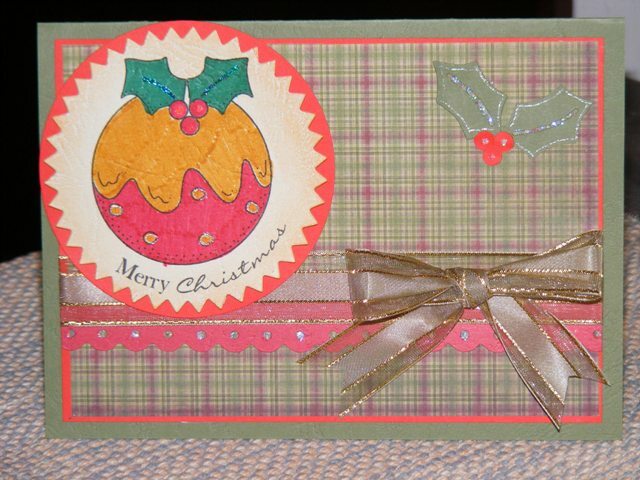 I am entering this card for the stamping 411 card challenge. Please do let me know how you felt about this card. I have heaps of these paper bags that we had bought from Delhi on our last visit. 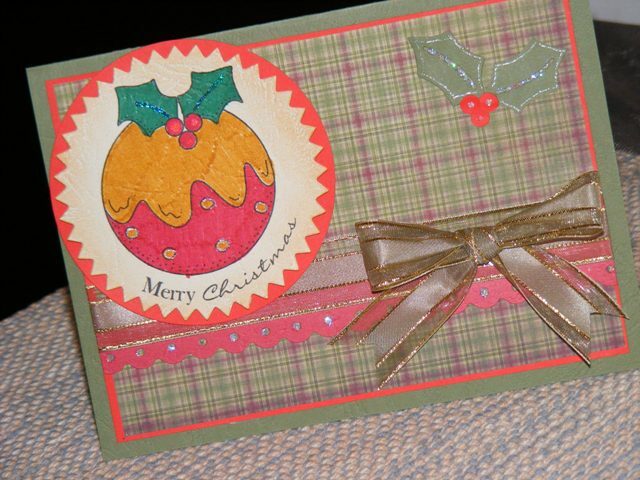 With just a few bits of papers peiced together and a ribbon here and there, I decided to give one of them a christmasy edge instead. Hope you like it. Here’s another christmas card. Very simple yet elegant in traditional colors with a girgham background. 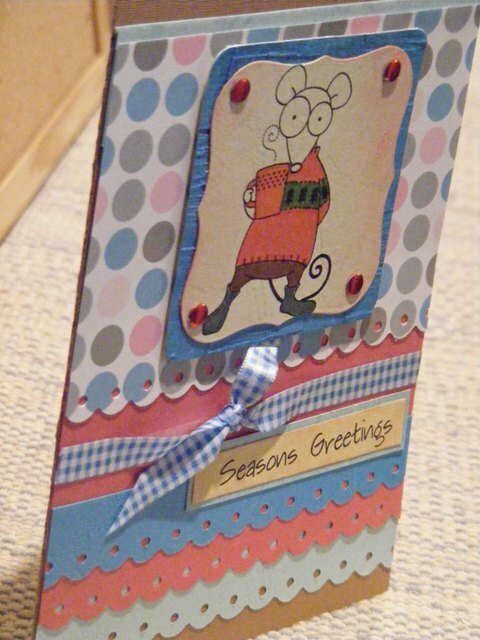 Although I felt I could have done much better with the finishing and polishing of this card ( but then dont I feel that way for all my cards !!) somehow I felt, I didnt want to over embellish it. 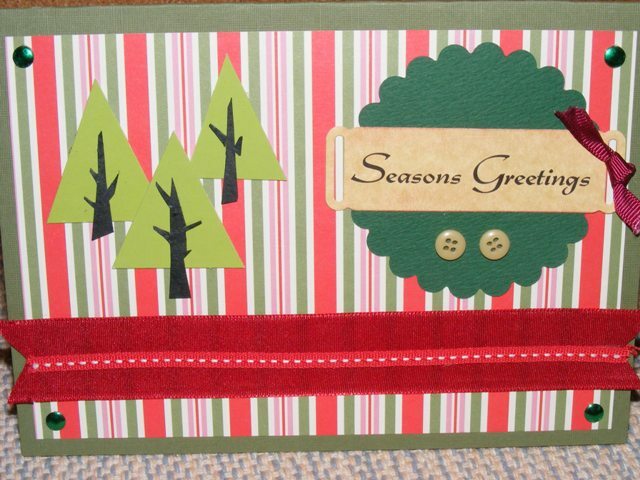 In very traditional colors of Red and Green, with the traditional evergreen tree. some pretty ribbons here and there and voila, we have our first christmas card of the season.